Martin Catrogiovanni boasts 109 caps and a formidable on-field presence, but his absence from the Italy squad at Murrayfield could actually put the hosts at a disadvantage, according to Scotland scrum coach Massimo Cuttitta. The Toulon prop will miss Saturday's Six Nations clash after suffering a bizarre injury when he was bitten on the nose by a friend's dog. His place in the starting XV is taken by Zebre's Dario Chistolini, while Wasps front-rower Lorenzo Cittadini is brought onto the bench. 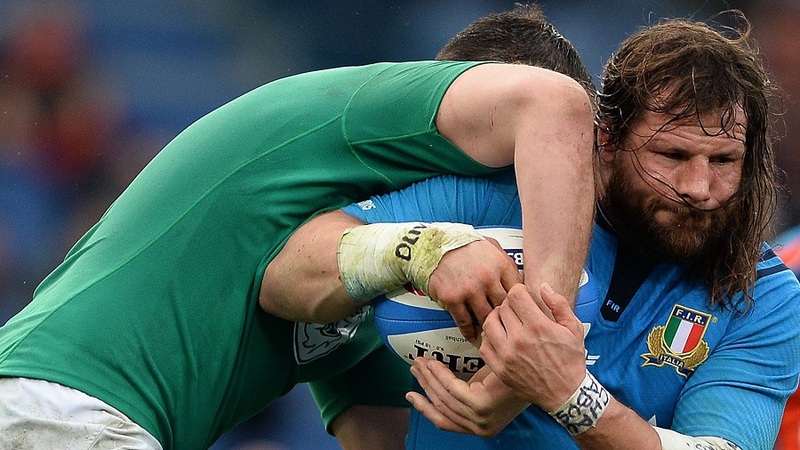 While Italy will lack the presence of Martin Catrogiovanni in the scrum at Murrayfield on Saturday, Scotland have their own sizeable hole to fill in the forward division. Lock Richie Gray, who has been a constant fixture in the side under head coach Vern Cotter, is out of the rest of the Six Nations with an arm injury, sustained in the agonising 26-23 defeat by Wales 10 days ago. Scotland scrum coach Massimo Cuttitta admitted it will be almost impossible to replace Gray's talents against Italy, but backed the likes of Jim Hamilton and Tim Swinson to step into the void. "Losing Richie has a big impact, but at the same time we've got the depth to cope," Cuttitta told ESPNScrum. "It's not easy to replace him because he's a world-classer, but the boys we have are grafters. They will do the job." Richie has formed an effective partnership with younger brother Jonny in Scotland's second-row, but Cuttitta - who himself played with brother Marcello for Italy - insisted the junior Gray will be able to cope without his sibling next to him. "They push each other, but Jonny will still do a good job without Richie alongside him," Cuttitta said. "It's always easier to play with your brother next to you, I definitely found it gave me a boost when I played with my brother. But we just have to get on with it. Unfortunately Richie is injured, and the others will have to perform well." Cuttitta, himself a 69-cap former Azzurri international, has warned that Italy will still present a daunting forward challenge in Edinburgh despite losing the vast experience that Catrogiovanni brings to the team. "Castro is an important aspect for their squad," Cuttitta told ESPNScrum. "But the boys like [Lorenzo] Cittadini and [Dario] Chistolini are developing. Cittadini is doing very well at Wasps - he's first choice and dominating just about everybody in the league. "Castro's at the end of his career and, while he's important for the youngsters and to bring forward the work that has been planned, I can see Cittadini doing well. He will step up. "I actually think it strengthens their scrum because they've brought good scrummagers in. Castro's important for the group, definitely. He's a world-class tighthead. "They'll miss his leadership, but from a scrummaging point of view, I think Cittadini is just as good, and Chistolini too." Scotland needed a last-gasp Duncan Weir drop goal to seal victory in Rome last year, but Cuttitta is convinced Saturday's battle will be won or lost among the forwards. "Whichever team is strong up front is going to win the game," he said. "We know we have to take them on, there's no shortcut, no throwing away the ball to the backs. You've got to win the set-piece or you're finished. Scrums can actually win you the game!" Saturday's meeting could yet prove to be a wooden spoon decider, although Scotland have looked far more impressive than Italy in this year's championship, with the hosts on the end of a narrow defeat by Wales 10 days ago. Cuttitta, however, has warned his Scotland charges against complacency, saying that Italy are improving all the time despite results not going their way. "Everyone says they've been standing still, but I ask another question," he added. "If they've been standing still, how can they score three tries against England? You can't argue with that."